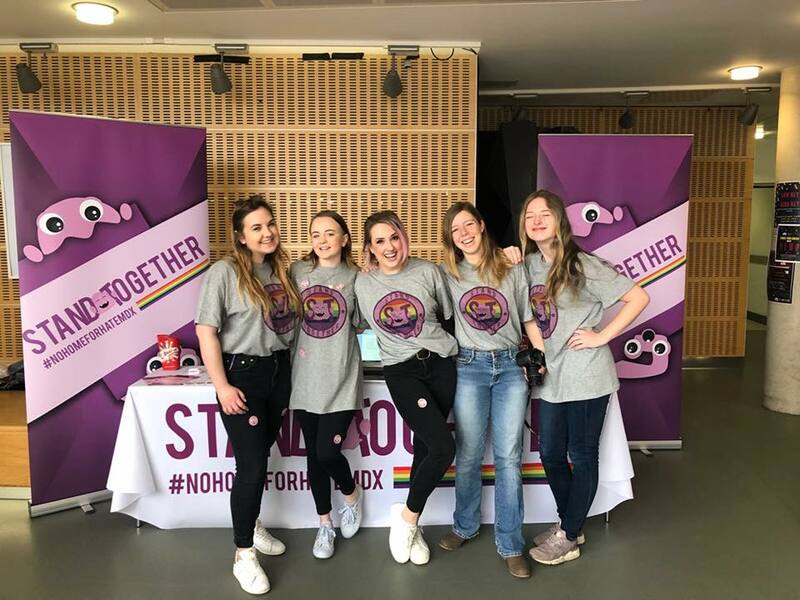 Five advertising, media and PR students from Middlesex University have been urging staff and students to “Stand Together” against anti-LGBT prejudice with a colourful multimedia campaign. Middlesex is among three UK universities to enter this term’s Peer to Peer: Facebook Global Digital Challenge - a global competition for tertiary level students, managed by EdVentures Partners and sponsored by Facebook, to create campaigns against hate speech online that feel authentic and credible. The best-performing teams fly to Washington DC for a final round. Students in the top three teams are recognised with scholarship awards worth $1000-$5000. 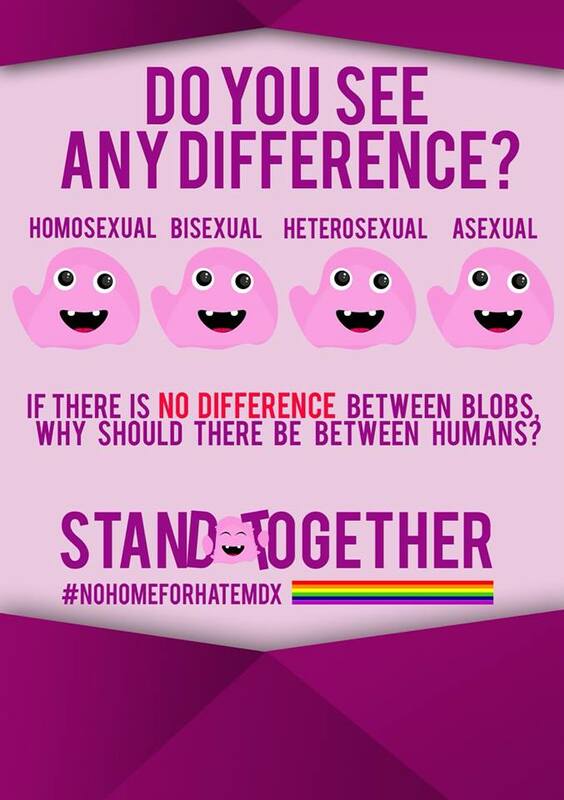 The Middlesex students’ campaign features an emoticon-like “Blob” mascot and a complementary alphabet of cartoon letters to define key terms such as ally, demisexual, and the Kinsey scale. The designs carry a message of empathy towards people of every identity and orientation, and of the importance of educating ourselves about the broad spectrum of gender and sexuality as it is now understood. The campaign uses animation and social media, and a face-to-face engagement element as the students handed out stickers and wristbands at a stall in the Grove atrium on Tuesday 17th April. “Graphic design is a good way of reaching people” says Erasmus student Paula Marmolejo Morazo, who made the imagery although she has never studied graphic design formally. The idea behind the Blob, with an endearing range of facial expressions, was to create “something that looks cute and nice to people,” and demonstrate “a very open campaign” which doesn’t exclude non-LGBT people, she says. “We’ve seen a normalisation of hate speech online. When we allow that to go unchallenged it becomes more powerful. This kind of thing is a really important way of addressing the issue"
The all-female team, only one of whom identifies as gay, found students receptive towards the campaign, but feel the experience shows them there is lots of work still to do to increase awareness and overcome societal pressures. Certain prejudices are impossible to defend, says third-year student Urszula Kwasniewska, “because you don’t have the knowledge – eg believing that bisexual people are ‘confused’”. She thinks it is difficult for many male students to talk about their sexuality, and welcomed Tom Daley speaking out about the experience of LGBT Commonwealth athletes as “very needed – someone who has the privilege of being heard”. The students worked on the campaign as part of an assessed module on their course, although they had a free hand in picking anti-LGBT prejudice as the subject and choosing the approach. Course tutor Martin McGrath says, “I think students have really enjoyed it. They like the idea of putting their skills against students from around the world. "It demonstrates stuff the university talks about is not just theoretical” he adds. “We’ve seen a normalisation of hate speech online. When we allow that to go unchallenged it becomes more powerful. This kind of thing is a really important way of addressing the issue". “At Middlesex University we recognise that people perform better when they can be themselves” says Director of Global Corporate Engagement David Williams. “We are passionate about ensuring LGBT colleagues can bring their whole selves to work”. The University has an LGBT+ Everyone Else Staff Forum, among a number of other equality forums, open to staff, students and the local community to help the University continue to be a place where everyone feels comfortable. “I have found that the staff and students at Middlesex have been extremely welcoming and helpful in all aspects of student living,” says Lauren Worthington from the Stand Together team. She chose Middlesex, she says, as she couldn’t find a degree programme elsewhere that combined Advertising, PR and Media in one course. “I have opened so much to the world here - I took part in elections, worked on this campaign and made friends from all around the world” says Urszula Kwasniewska. “I have always considered the academic staff to be how students really want them to be: friendly and helpful”. Martina Vancova had the opportunity to do the second year of her course at Middlesex's Mauritius campus, which she describes as one of the best experiences in her life so far.